As an Academy Award-winning Deaf actress, Marlee Matlin also has another job in her portfolio, which is a novelist. Her book ‘Deaf Child Crossing’, is the first of the trilogy in the series and where she made her debut as a writer. Even though it’s not a book that will standout from the crowd, there are a number of things that you can learn from it, especially for the pre-teens, regardless of whether you are hearing or deaf. Cindy looked straight at Megan. Now she looked a little frustrated. “What’s the matter? Are you deaf or something?” she yelled back. Megan screamed out, and then fell to the ground, laughing hysterically. “How did you know that?” she asked as she laughed. Megan is excited when Cindy moves into her neighborhood — maybe she’ll finally have a best friend. Sure enough, the two girls quickly become inseparable. Cindy even starts to learn sign language so they can communicate more easily. But when they go away to summer camp together, problems arise. Cindy feels left out because Megan is spending all of her time with Lizzie, another deaf girl; Megan resents that Cindy is always trying to help her, even when she doesn’t need help. Before they can mend their differences, both girls have to learn what it means to be a friend. 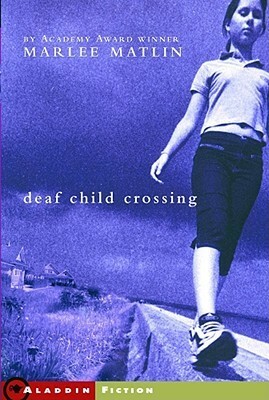 Deaf Child Crossing will strike a chord with anyone who has ever had, or wanted, a best friend. “I’ve always wanted to write a book relating my experiences growing up as a deaf child in Chicago. Contrary to what people might think, it wasn’t all about hearing aids and speech classes for me or frustrations that I felt growing up deaf. I grew up in the early 70’s and it was very Brady Bunch with our family, with a funny, Matlin twist. Here’s one example. We had a dog, Apples. But unlike Tiger on the Brady Bunch, our dog was 13 years old, toothless, blind and had the worst breath this side of Jabba the Hut. But he was the sweetest dog you could ever ask for and I cried and cried when he died. The story behind ‘Deaf Child Crossing’ is pretty straightforward, but that’s not necessarily a bad thing. It’s a sweet journey between two 8-9 years old girls, one deaf (Megan) and one hearing (Cindy), who have built up a friendship after Cindy moved into the same street as Megan, who was desperately seeking a friend to hang out with in the neighbourhood. During that stage, Cindy became fascinated by the idea of communicating with sign language and gradually started to learn it, much to the excitement of Megan. And they became best of friends in a short space of time. Cindy then became excited to go to a summer camp and tried to convince Megan to go with her, who was initially reluctant but then eventually decided to go. But the dynamic of the relationship has quickly changed when another deaf girl, who is much more fluent at sign language than Cindy, became friends with Megan at camp. And Cindy started to feel left out. This book is mainly targeted at the younger pre-teen market, perhaps between the age of 8-12 years of age, and it’s a great way to introduce children how a friendship between a deaf and hearing person is just like any other. It contains laughter, compassion, patience as well as arguments, rifts and even separations. Like any other friendships that we have all experienced, but not necessarily something a child has gone through yet in the early stages of his/her life. The key point is that it’s for the pre-teen market, and the fact that it’s a very simple and straightforward storyline just shows that. There is nothing over the top or dramatic about it. There are no cliff-hangers or anything that will keep you on the edge of your seat. But the writing and storyline is clearly not for adults, and that is fine. Perhaps it’s why it was easy for me to finish the book very quickly. I also get the feeling that’s what Marlee is trying to convey to any young readers about friendships with a deaf person in the hearing world. I can imagine a young child who is hearing, like Cindy, who may have not been exposed to the Deaf community and is starting to learn it. But you can also play it the other way round. A d/Deaf person who is reading it, like Megan, is trying to understand what a hearing person goes through when he/she is trying to understand the concept of sign language and living in a hearing world with barriers. The book also has a personal element to Marlee’s own upbringing, as she mentioned in her comments above. For example, the fact that Billy Joel’s song is featured often is obviously a link to Marlee’s past. And Apple the dog with a bad breath also features in this book as well as Marlee’s own past. So it does seem like a fusion of a novel and biography. “Her hands seemed to float in the air like butterflies, each butterfly representing a word. It almost looked as if her hands were in control of the music. Even Megan’s face and body moved in perfect unison to the music. For a moment, Cindy actually thought she could understand what Megan was saying, without speaking. For Cindy, Megan’s face and hand movements seemed to make sense to her. As someone who is learning sign language, this is a very beautiful way to describe this language. And you can imagine for someone like Cindy, who is trying to get the gist of sign language, it’s a weird and wonderful thing to watch for the very first time. Since I am not the main target market, it is difficult for me to give an accurate rating of this book. This is a good book if you know any pre-teen in your circles of family and friends, and you want that person to understand the possible dynamic between a hearing and d/Deaf person. It does touch upon the importance of respect and equality, as well as the challenges that a deaf person has in the hearing world. But deaf aside, it will resonate with any young readers who has or want a best friend, and you want to make it work despite going through challenges. Even as an adult, you can still pick up a few things about how young children’s relationship can work. And because there are elements of Marlee’s own personal experience, it is almost like a reading a deaf child’s biography.